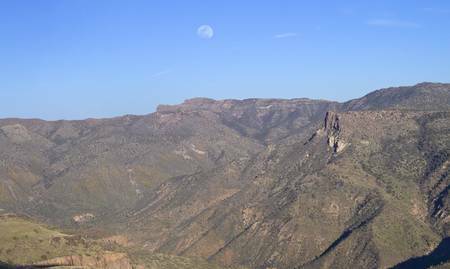 The remote beauty of the Eastern Superstition Wilderness with Two Bar Mountain beneath the moon. Reavis Falls are in the valley below the prominant cliff formation. The areas of yellow on the far slopes are blooming Mexican Poppies (Eschscholtzia, arizona, californica). Taken during a week long backpack to Reavis Falls.